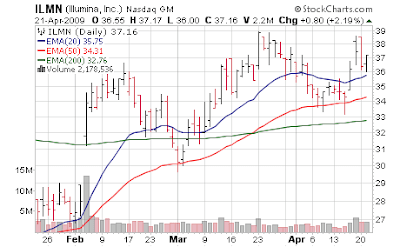 After the bell we have Illumina (ILMN) which continues its solid performance; I dislike their earnings reports because they are very confusing with all the pro forma, non GAAP, exclude tax, exclude executive compensation adjustments. Exclude tax? Who do you think you are, Timothy Geithner? Comparing apples to apples is a monster with this company's reporting vs analysts expectations. This confusion always seems to wreck havoc with the stock trading immediately after earnings [Oct 22, 2008: Restarting Illumina on Earnings Confusion] ... the stock is down 8% after hours to $34s which is fine - we only have a 1.1% stake since we don't play earnings roulette. Looking at the chart there are some clear signpots - we want to see $33 held, if that breaks the stock could be in limbo for a while. Frankly, I prefer to pay up in this type of situation and see the stock at $35... the other positive place to buy would be a breakout over $39. The "double top" near $39 could be a a line in the sand limiting any real upside movement. So we'll see what tomorrow brings after analysts have the night to decipher GAAP v non GAAP. They have 9 other (count em!) adjustments to get from .14 cents .28 cents. So the truth is somewhere in the middle. Even their gross margins and the like are done in GAAP vs non GAAP - ugh. Anyhow they are generally growing (thankfully revenue is not GAAP v non GAAP) and as always a pricey stock. For the first quarter of 2009, Illumina reported revenue of $165.8 million, a 36% increase over the $121.9 million reported in the first quarter of 2008. The Company reported net income for the quarter of $18.8 million, or $0.14 per diluted share, compared to $10.7 million, or $0.08 per diluted share in the comparable period of 2008. Net income for the first quarter of 2009 included non-cash charges of $14.9 million in stock compensation expense associated with SFAS No. 123R, $4.7 million in non-cash interest expense associated with the adoption of FSP APB 14-1 and other items listed in the table entitled “Itemized Reconciliation Between GAAP and Non-GAAP Net Income Per Share.” (oye!) Excluding the impact of these items, and net of pro forma tax expense, Illumina’s net income on a non-GAAP basis for the first quarter of 2009 was $35.4 million, or $0.28 per diluted share, compared to $22.5 million, or $0.19 per diluted share, for the first quarter of 2008. Shipped 12 additional Genome Analyzers to the Beijing Genome Institute, bringing their installed base to a total of 29 systems. Entered into an agreement with the Genome Center at Washington University School of Medicine in St. Louis to acquire 21 Genome Analyzers over several months to support the Center’s expanding research initiatives. Once the installation is complete, the Center will have an installed base of 35 Genome Analyzers. Presented a development roadmap for the Genome Analyzer that charts a path to more than 95 Gigabases of high quality sequence data per run by the end of 2009. This will be accomplished through advances in the system’s chemistry, software algorithms, and hardware to improve accuracy, read length data density, and ease of use. Due to the strength of the first quarter we now expect revenue for 2009 between $700 and $720 million, representing year-over-year growth between 22% and 26%. On the low end of the range, this is an increase of $10 million over the original guidance of $690 million. We expect our gross margin percentage to be in the mid to upper 60s. We expect non-GAAP earnings per fully diluted pro forma share between $1.13 and $1.23. We expect the full-year pro forma tax rate to be approximately 33% and stock compensation expense of approximately $64 million or a tax adjusted amount of $0.32 per fully diluted pro forma share. The Company expects full-year weighted-average diluted shares outstanding for the measurement of pro forma amounts to be approximately 133 million. For the second quarter of 2009, we expect revenues between $168 and $173 million. We expect earnings per fully diluted share of $0.27 to $0.30 assuming approximately 131 million shares. We expect stock compensation expense during the second quarter of approximately $16 million or a tax adjusted amount of $0.08 per fully diluted pro forma share. So in my eyes take away 8 cents from 27 to 30 cents, and you get 19 to 21 cents for next Q and we'll be confused by what they report in 90 days all over again. EPS has become such a game of accounting that for many companies I am simply at the point of looking at revenue growth, and margins (especially of the gross variety)... the rest I'll leave to green eye shade folks to "manipulate" to their hearts desire. Revenue is the one thing most companies (ex Enron and some financials) have not yet figured out a way to cheat at; so it's the most pure.